OMG! I knoooowww! I haven't been in touch for a long time. I keep breaking my promise to you guys. BUT. I do have a valid reason for not updating this blog for about a month. To begin with, I ran out of my skincare products at once and they were all sold-out in Althea and Nature Republic. So, what I did (which I shouldn't have done) was to start a new skincare regimen with new products I can find locally available here. And that's when I had the most miserable acne + eczema breakout I ever had since high school. Lactezin wasn't helping with the breakout anymore. I had so much on my cheeks and chin. (I still take Lactezin now, don't get me wrong, it is a great product, it's just that I don't think it is the solutions for all your acne problem but it sure helps up to a certain degree). So, I called my sister and aunt who were both a regular customer at Let's Face It Facial Salon. They told me to seek a dermatologist there to get proper assistance and medication. To cut the story short, I did consult one of their dermatologist in SM Fairview branch. I showed him the products that I currently use and he told me that they were fine and great as hydrating products but were not okay to combat my acne. 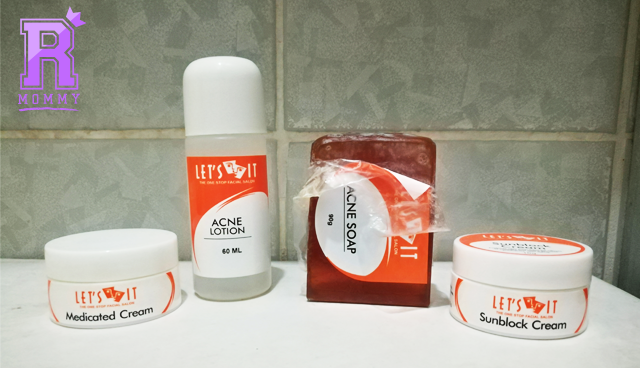 So I did a Pimple Gel Mask Facial and bought their Acne Set. Upon purchasing the set, they will give you a printed instructions on how to use the set. I did this routine for 5 days straight and OMG, the pain I felt while using this set was more than when I was giving birth. Like, seriously. My face started to get really swollen, red, and tight. I couldn't move my face and eyes much cos it hurts AF. My face is so tight that every movement of my face muscle will hurt AF. I stopped using the set and used Dove bar soap and 100% aloe vera gel cos I can't bare the pain anymore. My face started to peel. YAAAY! This is the gross part. There's still a lot of discoloration on my face but it was okay cos the peeling is somehow very comforting, I can also see that the new skin is better and my pimples were all dried up. I started using back my Stelatopia cream cleanser for eczema skin cos I was afraid that the dryness of my face from the peeling and medication will trigger my eczema. I still continued using Dove bar soap. The redness of my face were all gone and my acne faded away. My skin is back to normal so I stopped using the entire set and went back to my basic skincare routine. I would recommend this set if your pain tolerance is really high. HAHA I honestly regretted it at first but the results is really nice. I maybe do it again if a bad breakout occurs. This is the first time I tried a peeling product to deal with my breakouts and I can honestly say that it's both painful and satisfying at the same time. I, 100% recommend the set for the brave souls. LOL But, remember to get checked first, okay? 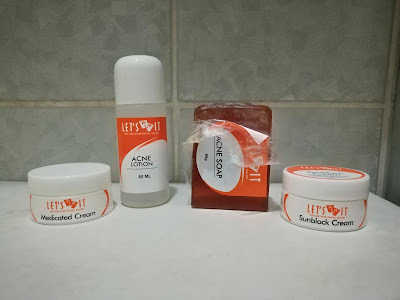 3 comments on "Let's Face It Facial Salon Acne Set Review"